Sage Moonblood Stallone (May 5, 1976 – July 13, 2012) was an American actor, film director, film producer, and film distributor. He was the eldest son of Sylvester Stallone. 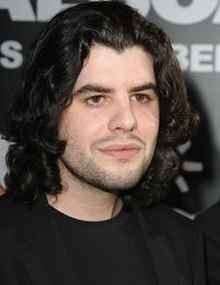 Sage Stallone was born in Los Angeles, California, the elder son of Sasha Czack and actor Sylvester Stallone. He was the brother of Seargeoh Stallone, and half-brother of Sistine, Sophia, and Scarlet Stallone. He was a nephew of actor and singer Frank Stallone, and grandson of Jackie Stallone. His stepmother was model and entrepreneur Jennifer Flavin. Stallone attended Montclair College Preparatory School in Van Nuys, California, where he graduated in 1993. He later studied filmmaking at North Carolina School of the Arts for one year. As a child, Stallone made a guest appearance on Gorgeous Ladies of Wrestling, brought by his grandmother Jackie Stallone, who promoted the series. Stallone made his acting debut alongside his father in Rocky V (1990), the fifth installment of the Rocky franchise, playing Robert Balboa Jr., the onscreen son of his father's title character. He did not, however, reprise the same role in Rocky Balboa, the sixth installment of the Rocky films as he was working on his own film Vic. He also appeared with his father in Daylight (1996). After that, he acted in lesser profile films. From 1994–1995, he attended the University of North Carolina School of the Arts to study Filmmaking. In 1996, Stallone and film editor Bob Murawski co-founded Grindhouse Releasing, a Los Angeles-based company dedicated to the restoration and preservation of exploitation films and B-movies. Stallone directed his first short film (outside of film school) Vic, which won the 2006 Boston Film Festival "Best New Filmmaker" award. His last projects were appearances in Vincent Gallo's last two films, Promises Written in Water and The Agent. Both films were shown in main competition at the 2010 Venice Film Festival and in the Toronto International Film Festival. A photograph of Stallone as a young child beside his father appears in the 2015 Creed, where it is stated that his character, Robert Balboa Jr., has since moved away to Vancouver. Stallone was found dead on July 13, 2012 at his home in Studio City, Los Angeles. According to reports, he had not been heard from for four days prior to his death. Empty prescription drug bottles were found at the scene, but after an autopsy and toxicology tests, the Los Angeles coroner determined that Sage died of coronary artery disease caused by atherosclerosis, with no drugs detected other than an over the counter pain remedy. At the time of his death, Stallone was reportedly engaged. Stallone's funeral was held on July 21 at St. Martin of Tours Catholic Church in Los Angeles. He is interred at Westwood Village Memorial Park Cemetery. ^ "Sage Stallone". Yahoo!. Retrieved June 9, 2012. ^ "Sage Stallone Biography". Rotten Tomatoes. Flixter (Time Warner). Retrieved June 9, 2012. ^ "Stallone Jr. Hopes Playing Rocky Jr. Won't Cramp His Lifestyle". The Los Angeles Times. Retrieved October 28, 2010. ^ Miller, Samantha (December 23, 1996). "Chip Off the Old Rocky". People. Archived from the original on July 18, 2012. Retrieved February 28, 2013. ^ "Interview with hot babes of GLOW, Gorgeous Ladies of Wrestling". Sports Climax. June 30, 2010. Retrieved July 15, 2012. ^ Leonard, Elizabeth; Nudd, Tim (July 17, 2012). "Sage and Sylvester Stallone: A Story of Heartache and Reconciliation". People. Retrieved February 28, 2019. ^ "Sylvester Stallone begs for privacy following the sudden death of his son Sage". FoxNews.com. Retrieved July 16, 2012. ^ Panther, Lewis (July 15, 2012). "Sylvester Stallone in state of shock over son Sage's drugs overdose death". People UK. Retrieved March 2, 2013. ^ "Sage Stallone Laid to Rest". People. July 21, 2012. Retrieved February 28, 2019. This page was last edited on 23 April 2019, at 12:24 (UTC).